There are certain medical issues that are very specific. They only occur in one place on the body and never spread to or appear on any other body part. Then there are other things that can appear almost anywhere on the body. Like cysts. 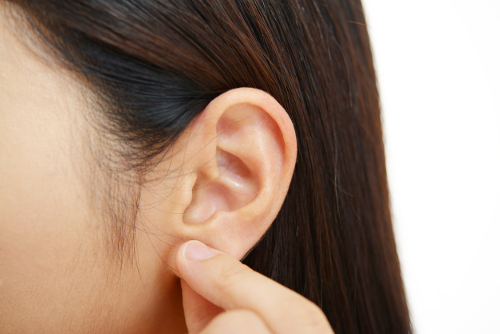 Did you know that cysts can pop up on various parts of the body, including the earlobe? But what causes a cyst in the earlobe, and is an earlobe cyst different than other cysts? This article aims to teach you all about the condition—from earlobe cyst causes and earlobe cyst symptoms, to earlobe cyst treatments and earlobe cyst removal. If you discover a cyst on your earlobe, this article will cover all the basics that you might need to know going forward. Earlobe cysts are also called epidermoid cysts, and they are caused by improper shedding of skin cells. Rather than shedding, the skin cells go deeper into the skin and begin to multiply. These cells eventually create the “walls” of the cyst and produce the keratin that fills it. The cysts can also be caused by damaged hair follicles. Risk factors for earlobe cysts include a history of acne, an injury to the ear area, and age (post-puberty). Cyst in earlobe symptoms include the formation of a bump on your ear, which tends to be hard and filled with liquid (keratin) that can solidify. If you are suffering from these issues, then the next step is for a doctor to diagnose the cyst. Diagnosing an earlobe cyst is relatively simple. The doctor will ask about your recent medical history just to rule out any other causes for the bump on your ear. The cyst will be examined, once again to determine whether it’s a cyst or something else. Once your cyst is diagnosed as such, you can move on to treatment. A warm compress might be able to help shrink and treat an earlobe cyst. Take a cloth and soak it in warm or hot water. Wring out the excess water and hold the cloth to the cyst for 10 to 15 minutes. The heat will help melt the keratin, which can help it leak out of the pores of the ear. It may end up being a little messy and gross, but it can work and reduce the size of the cyst. Turmeric has often been used as a home remedy for various ailments as it has many anti-inflammatory properties. These properties could also help get rid of an earlobe cyst. Mix a little turmeric powder with some water to produce a paste. Apply the paste to the cyst and leave it there for 20 minutes before you wash it off. Repeat this process once a day for several days. Used in home remedies of all sorts, tea tree oil may also be able to help you reduce your earlobe cyst. Take a cotton ball and dip it into tea tree oil. Then, place it against the cyst for approximately five minutes and repeat this once or twice a day. This should help dry up the earlobe cyst. You may be aware that you can use a clay mask for skin care. That clay mask material could also be used to help treat your cyst. Take a little piece of the clay and rub it onto your ear just before bed. Allow it to dry and then go to bed. In the morning, wash the clay off. Repeat this once a night for several days to help clear up the cyst. If the cyst is really hard and big, surgery may be required to drain and remove it. This is usually day surgery, so you can expect to go home immediately. After the cyst is taken care of, the doctor will often prescribe antibiotics in order to help clean up the area and prevent infection. A cyst on the earlobe can be annoying and gross, but for the most part, they aren’t a huge issue. They are rarely painful or dangerous to your health. That being said, earlobe cysts are easily treated by both home remedies and medical treatments. So, if you notice that a cyst is forming on your ear, don’t panic; just relax and try one of our home treatments until you can go see a doctor. Falck, S., “Earlobe Cyst,” Healthline, March 13, 2017; http://www.healthline.com/health/earlobe-cyst#overview1, last accessed May 18, 2017. Vin, M., “Home Remedy for an Earlobe Cyst,” eHow; http://www.ehow.com/way_5503400_home-remedy-earlobe-cyst.html, last accessed May 18, 2017. “Earlobe Cyst Facts,” Steady Health; http://ic.steadyhealth.com/earlobe-cyst-facts, last accessed May 18, 2017. “Cyst on Earlobe: Causes, Home Remedies and Treatment for Earlobe Cyst,” Tandurust, May 13, 2010; http://www.tandurust.com/ear-care/cyst-on-earlobe.html, last accessed May 18, 2017.